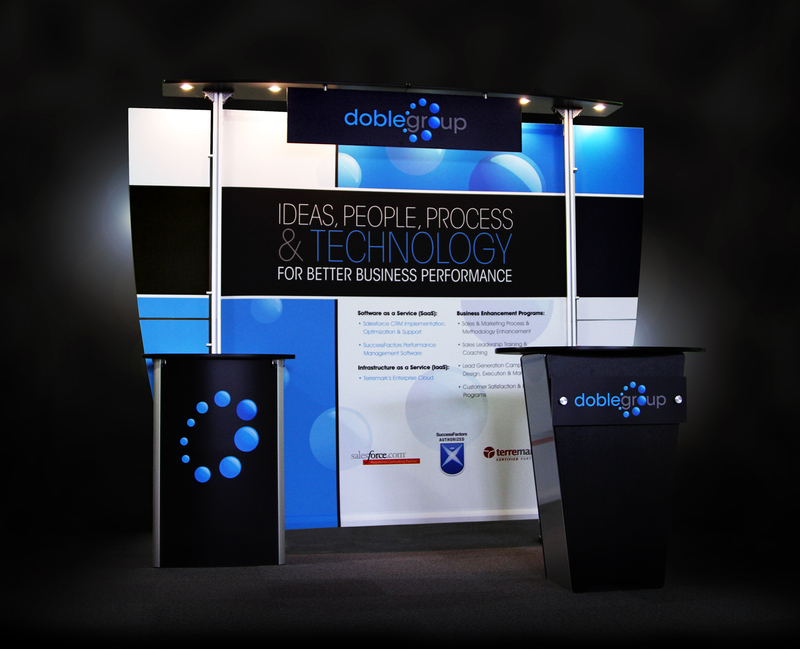 Modular Displays offer a custom looking trade show display at a fraction of the cost. Another benefit is the flexibility of the trade show hardware. Often times, one display offers several different setup solutions. Exhibit Line Displays (pictured above) are one of the most popular brand of modular display on the market today. Choosing a modular display for your next trade show can be an excellent choice, but it’s imperative that it’s an informed one. There are so many different modular, or “hybrid”, displays on the market today that it’s hard to know what’s different about each kind. There are so many characteristics to consider: steel truss, aluminum extrusions, fabric or laminated graphics, tools, cases, weight, shipping, assembly – the list goes on. Hopefully this article can give you a better idea of what to expect with the Exhibit Line display system. Exhibit Line is manufactured by Pascale Engineering, located in beautiful Sarasota, Florida. Founder, Rafe Pascale, began his company in Rochester, New York and relocated in 2010. An avid windsurfer, this seemed to be a good fit. Exhibit Line came onto the market in 2005 and is now sold by a number of different exhibit and display companies across the US. It has evolved and improved its structure and setup, and has given root to some new display systems that are similar in construction: XR Line and XV Line. While Exhibit Line remains the most functional system, these two newer additions to the Pascale family of displays use unique mounting techniques, higher end materials, and attractive designs to set themselves apart. Exhibit Line boasts tool-free assembly, six color choices, simple setup and break down, and easy packing into flat wheeled shipping cases. XR Line and XV Line have a bit more work to do in these areas. They require multiple tools (mostly allen wrenches) and take up more space in a single case than the Exhibit Line. Subsequently, shipping costs are higher and setup time is longer. Fabric is the most frequent media choice for printing artwork on any of the Pascale display systems, but laminated panels are also an option. Fabric is recommended due to its ability to fold up for quick and easy storage. Lights are built into the canopies of these displays, as shown in the picture at the top of this page. In most cases, they consist of six 20w halogen lights, or siz 5w LED lights instead. They provide ambient light as an accent and should not be relied upon for substantially illuminating any backwall artwork. Display setup is not self explanatory and does take some practice. But detailed instructions with pictures are included with every display, and the end user or every day booth staffer should be able to set it up with minimal issues. Overall, Pascale Engineering is truly a pioneer in the industry and has created a high quality standard that other manufacturers can imitate, but few can match.